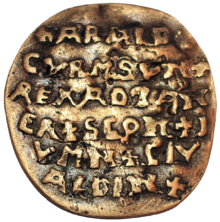 An artifact,[a] or artefact (see American and British English spelling differences), is something made or given shape by humans, such as a tool or a work of art, especially an object of archaeological interest. In archaeology, however, the word has become a term of particular nuance and is defined as: an object recovered by archaeological endeavor, which may be a cultural artifact having cultural interest. 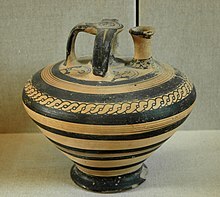 However, modern archaeologists take care to distinguish material culture from ethnicity, which is often more complex, as expressed by Carol Kramer in the dictum "pots are not people". 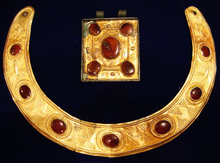 A 2nd century AD Sarmatian-Parthian gold necklace and amulet from the Black Sea region. In ethnography and archaeology, a category of "ancestral artifact" has been proposed, defined as "any object of natural raw material (chert, obsidian, wood, bone, native copper, and so on) made by a people following a lifestyle based on foraging (e.g. hunting, gathering) and/or basic agriculture or pastoralism (e.g. horticulture, transhumance)". ^ "artefact. (n.d.)". Collins English Dictionary - Complete & Unabridged 11th Edition. Retrieved 2 August 2012 – via CollinsDictionary.com. ^ Carol Kramer, "Pots and Peoples" in; Louis D. Levine and T. Cuyler Young (eds. ), Mountains and Lowlands: Essays in the Archaeology of Greater Mesopotamia; Malibu, Undena, 1977; cited in Serge Cleuziou, "Introduction", Objets et symboles: de la culture matérielle à l'espace culturel : actes de la 1re Journée doctorale d'archéologie, Paris, 20 mai 2006, Ed. Laurent Dhennequin, Guillaume Gernez and Jessica Giraud, Paris: Sorbonne, 2009, ISBN 9782859446222. (in French). ^ Peacock, Evan (January 1, 1991). "Distinguishing between Artifacts and Geofacts: A Test Case from Eastern England". Journal of Field Archaeology. 18 (3): 345–361. doi:10.1179/009346991791548645. ^ Hortolà, Policarp (2017). “From antiquities to memorabilia: a standardised terminology for ancestral artefacts according to manufacture date”. Studia Antiqua et Archaeologica. 23 (2): 213–225.